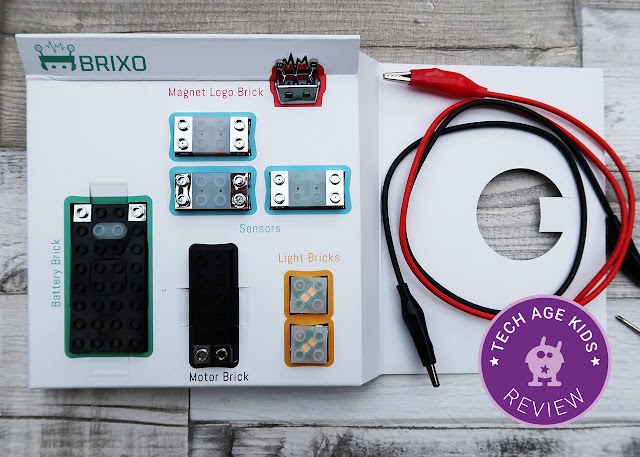 Brixo is a LEGO-compatible electronics kit with conductive blocks, lights, motors and sensors. 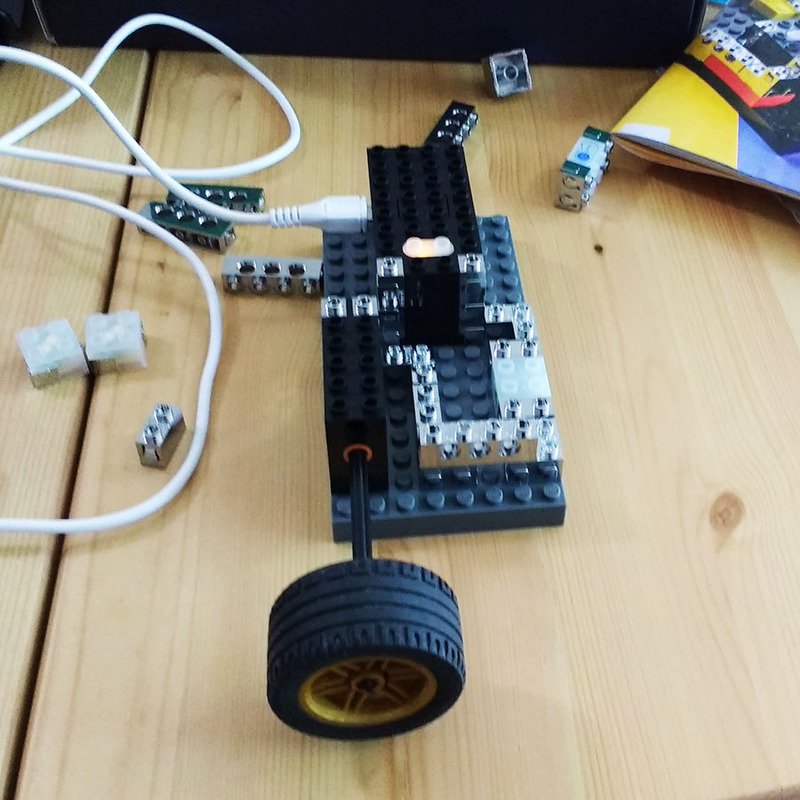 The chrome-coated LEGO compatible bricks mean that you can add controllable lights and motors to projects without needing wires. We backed the Brixo Kickstarter and recently received our Brixo Standard kit. Brixo comes in a cardboard box with an additional cardboard sleeve. The kit is nicely presented with a fun insert. The box takes up quite a bit of space relative to the contents and the cardboard won't last for long-term storage if it's used regularly. You can power Brixo via a micro USB cable or use a 9V battery in the battery box. It's great to be able to power from USB when you don't need portability. Very practical. The main Brixo unit is quite big and so is the motor so this kit needs to be used to add features to fairly large models. We kept finding that we had one block gaps in our circuits and there are no blocks with odd sizes! But once we'd figured out how to make a circuit everything worked well. We like that you get a pair of crocodile clips that can be used to troubleshoot circuits. Sensors make circuits interesting. 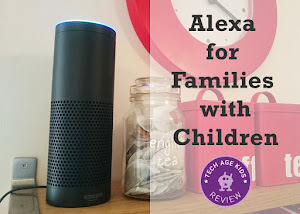 We really like the choice of sensors and the way they work. I wish the text on them was a bit bigger though! 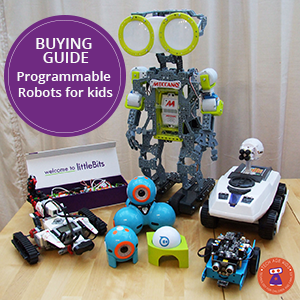 The proximity sensor is a reed switch which is triggered by the awesome magnetic robot head which is included in the set. The sound sensor behaves like a toggle. One clap closes the switch and the next clap opens it. The light sensor turns off when it detects light and on when it's dark. To turn it off, shine a torch on it. The connectivity seems pretty good. The blocks make a great connection vertically. We could stack up all the blocks we had and light a block at the top without a problem. 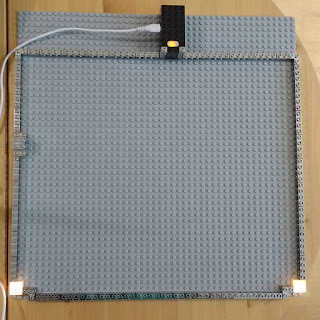 We could also create a big horizontal circuit on a large LEGO board. I expected this to fail as the board isn't very flat but it worked just fine, even with an active sound sensor in the circuit. This means that you can build a pretty big structure and get power around it. Short circuits are pretty inevitable when working with Brixo. Luckily the power supply is protected and a short circuit is indicated with a red light. You can press the button to reset the unit. There's a Brixo app that offers building guides and suggestions. This is great. We much prefer content that we can view on a device to have printed material. Bluetooth control of the power supply isn't supported yet but is promised. My 10 year old soon devised an intruder-activated weapon (of course he did ...) The motor is compatible with LEGO axles so you can quickly create stuff that spins. Some bricks are hard to remove from the board so a brick removal tool is handy to have around. You get lots of conductive bricks so there's plenty of scope for getting power to where you need it in a model. 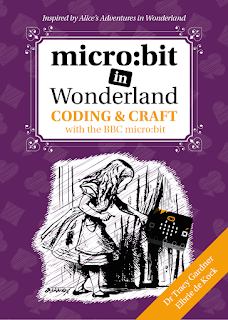 You definitely need to construct a circuit first and then build around it to make sure you can create a valid circuit. My kids really wanted a linear actuator component so that they can easily create sliding doors and trapdoors. 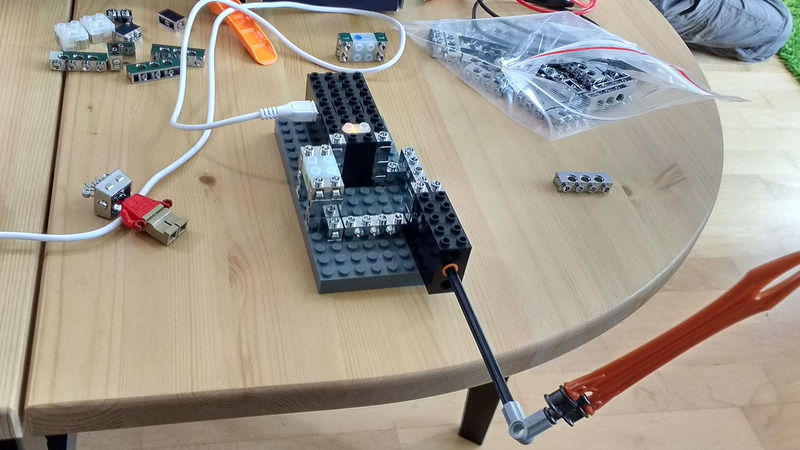 Servos with LEGO attachments would be fun too. Brixo was delayed quite a bit from its original dates, but we pretty much assume this will happen! Electronics Kickstarters often underestimate the amount of time it will take to address manufacturing issues and get through any certifications required. We've said it before and we'll say it again, don't crowdfund a project expecting it to be the main birthday or Christmas gift for your child. 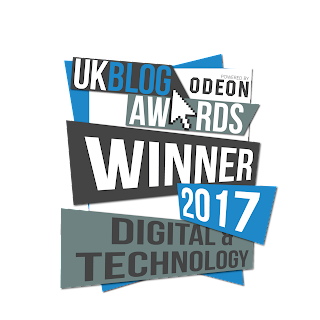 Brixo wrote regular updates on how the project was going and for us following along is part of the experience. Well, Brixo works. It does what it says. It's a fun way to introduce LEGO-mad kids to the basics of electronic circuits. The chrome-covered blocks look very cool and are easy to integrate into LEGO models with a bit of planning. The way they connect (and don't) is a bit confusing at first. We've found that there's a ton of logical thinking involved in designing a circuit that puts the action and trigger blocks where you want them. This is either frustrating or a learning opportunity depending on your perspective! We've gone for the latter. The range of components is pretty limited at the moment but there's quite a lot you can do with sensors, lights, and motors. The trigger bricks just work. The ability to easily reverse polarity and having the sound trigger work as a toggle are great features. There was definitely potential for a product like this to have connectivity problems but we've found that it works well if you stick to the building rules. 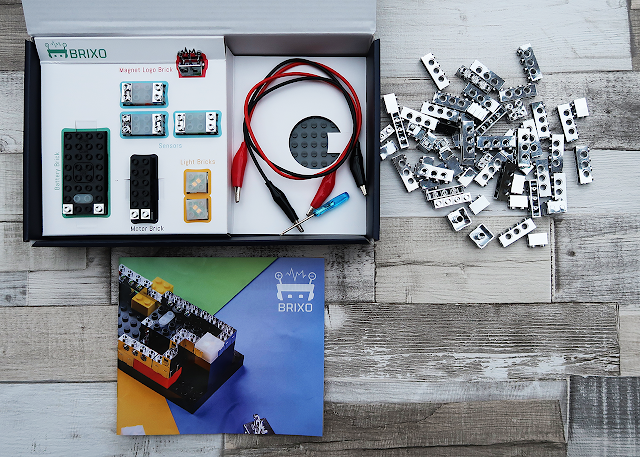 You can currently pre-order Brixo kits via Indiegogo. Does this integrate at all with Lego Power Functions motors and lights? It's now late December 2017 and I still haven't received my kit... and they are now available on Amazon and Best Buy. Response from the company was immediate and unapologetic.